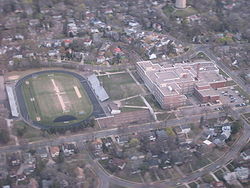 "History of Washburn High School"
Minneapolis Washburn High School is a four-year public high school serving grades 9–12 in the Tangletown neighborhood of Minneapolis, Minnesota. By enrollment, Washburn is the third-largest high school in the Minneapolis Public School District and offers the International Baccalaureate Diploma Programme. Dr. Emily Lilja Palmer, formerly of Sanford Middle School, was named the principal on July 2, 2018. Washburn High School was built in 1925 to meet the demands of the growing South Minneapolis neighborhood. Construction for the new three-story building began in 1924 after the Minneapolis Board of Education purchased unused land in Washburn Park. Land next to the school was occupied by the Washburn Memorial Orphan Asylum, now torn down and replaced with what is now Justice Page Middle School (formerly Ramsey Middle School). Washburn is located in the Tangletown neighborhood of southern Minneapolis at 201 West 49th Street. Washburn opened on September 8, 1925 to 1,031 students. When the school opened, it served 7–10 grades and added one year each year for the next two years. It served middle school and high school students until 1929. The school became very popular and by 1931, 2,370 students attended the school built for 1,500. The school has been expanded several times to meet the demands of high enrollment. The school is conventionally named after Cadwallader C. Washburn. When the school was presented to the school board it was called "William D. Washburn High School", in reference to the brother of Cadwallader C. Washburn, however naming the school after William D. Washburn is thought to be an error. The school has been heavily influenced by Minneapolis' milling empire. The school's newspaper, The Grist, involves milling terminology, the school's colors, blue and orange, were those of Gold Medal Flour, a company partly run by the Washburn family and a predecessor to General Mills and the athletic teams' nickname are the "Millers". Washburn is located on a 4½-city block parcel bordered by West 49th and 50th streets on the north and south side and Nicollet Ave. S. and Pleasant Ave. S on the east and west. In addition to Washburn, Justice Page Middle School shares this parcel of land, with Washburn taking 2/3 of the space. In between the schools is A. E. MacQuarrie Field which hosts football, soccer, lacrosse, and track and field competitions. In addition, the area between the school and field is a green space known as The Mall. Youth soccer teams, specifically the Fuller Soccer program from a neighboring park, use The Mall for games on weekends. A tunnel connects the east side of Washburn and the west side of Page, running under MacQuarrie Field. The tunnel transports heating and air conditioning between the schools. During the winter, snow melts directly above the tunnel due to the steam pipes within showing the tunnel's location. Decades ago, students used the tunnel during the winter when overcrowding forced Washburn to hold classes in Ramsey. In the 2006–2007 school year, Washburn enrolled 1,217 students. The same year, the school reported a racial makeup of 50.7% Black, 26.0% White, 12.2% Hispanic, 7.7% Asian and 3.4% American Indian. In 2007, 60% of students qualified for Free or Reduced Price Lunch. 18% of students have limited English proficiency, and 13% of students qualify for special education. The school has an Adequate Yearly Progress graduation rate of 89.94% while district-wide 43.7% of students graduated during the 2003–2004 school year. 29% of students met or exceeded the standards in the 10th grade Minnesota Comprehensive Assessment Series II test, while 14% met or exceeded the standards for the 11th grade MCAS test in 2007. During the 2016–2017 school year, 49 percent of the students were of African, Hispanic, Asian, or Native American descent. Since 1991, Washburn has participated in St. Olaf College's Educational Talent Search TRIO program which provides students with skills necessary to complete high school and earn postsecondary education. During the 2006–2007 school year, Washburn employed 95.12 staff FTE. 59.34 of those staff were teachers. 44.34% of the teachers held a bachelor's degree while 52.29% held a master's degree. During the 2005–2006 school year, the student to teacher ratio was 21:1. Both parents and students are involved in the decision-making process through our student council, school leadership team and Parent/Advisory Boards for each SLC. Besides offering the International Baccalaureate Diploma Programme (IBDP) to juniors and seniors, Washburn offers Advanced Placement (AP) and Career and Technical Education (CTE) classes for ninth through twelfth grade students to earn college credit free of charge. Washburn also uses school-wide advisory programs to form trusting and caring relationships for each student. In addition, Washburn students can apply for and enroll in PSEO classes at the University of Minnesota, Minneapolis Community and Technical College, Concordia University, Normandale Community College, Dunwoody College of Technology, and North Central University. Washburn offers bilingual classes in Spanish and Somali, and English as a Second Language (ESL) support is also available. Washburn currently offers four world languages: Arabic, American Sign Language (ASL), French, and Spanish. The school also offers jazz band, concert band, orchestra, concert choir, and pop choir, as well as its varsity choir, Miller Voices. Starting in 2016, Washburn productions include an underclassmen musical in the fall, a larger Spotlight musical in the winter, and a straight play or musical in the spring. The winter and spring productions are open to all students, but typically star upperclassmen. Washburn students have a variety of opportunities to participate in extracurricular activities, which take place before and after school. Notable organizations include: ACE (Architecture-Construction-Engineering), Amnesty International, Art Club, Book Club, College Club, Community Service Club, Dare 2 Be Real, Debate, Feminism Club, Green Team, The Grist newspaper, GSA, Knitting Club, Math Team, Mountain Biking Team, National Honor Society (NHS), Native Club, the Odyssey magazine, Otaku Club, Philosophy Club, FIRST Robotics Team, Marine Scuba Club, Silver Ribbon Club, Student Council, Teen Council, TRiO Educational Talent Search, and Urban Farm. In March 2008, the Minneapolis Board of Education announced that Washburn would be one of two high schools participating in the Minneapolis Public Schools Fresh Start program. Along with Edison High School, Washburn hired new teachers and staff and examined their curriculum. These changes were part of a nine-point-plan by the Minneapolis school board to alleviate budget problems and prepare 4 out of 5 graduates to be ready for college. Principal Carol Markham-Cousins returned to lead the school with the rest of the teaching staff required to apply for rehire or as new to the building. On May 14, 2008 Markham-Cousins sent letters to students and family members explaining the reasons for the Fresh Start. She cited graduation rates and college preparation as two reasons why the program had to go forward. The same day, students staged a walk-out in protest of the program. Student drew with chalk on the sidewalk in front of the school in support of the teachers. Additional changes that came to Washburn during 2008-2009 included an increase in the number of art classes and the introduction of the International Baccalaureate program. Film and television actor most famous for portraying Marshal Matt Dillon on long-running TV series Gunsmoke. Golfer, founding member of LPGA, inductee in World Golf Hall of Fame. Class of 1967, astronaut, 2008 Astronaut Hall of Fame inductee. Class of 1929, film and television actor with star on Hollywood Walk of Fame. Best known as Slug, member of hip-hop duo Atmosphere. Football player drafted by Oakland Raiders in 2003 (currently the Boys' Varsity Tennis coach at Washburn). Best known as R.L., frontman of Next. Best-selling author, NBC Today Show correspondent, social media pioneer.